UK, 1967, 109 minutes, Colour. John Mills, Hugh O' Brian, Nigel Green, Tom Nardini, Adrienne Corri, Ronald Howard. 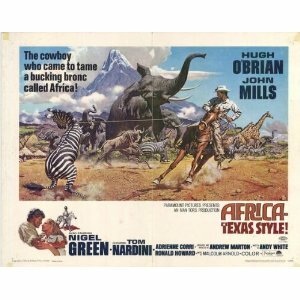 Africa - Texas Style is a pleasant family film combining the elements of a western with animal life and safaris in Africa. Hugh O' Brian is a solid presence as the cowboy. John Mills is very British as Wing Commander Hayes who employs him to round up animals for domestication and to save the plains of Africa from becoming desert. Nigel Green gives a very good impersonation of an Afrikaan type cattle rancher. Adrienne Corri adds some romantic interest. There is an attractive young African boy who is meant to steal the heart as so many Hollywood children. Production is by Ivan Tors, responsible for many family adventure films, and direction is by Andrew Marton, one of his regular directors and a man famous for second unit work as, for instance, with the chariot race in Ben Hur. There is a humorous guest appearance by Hayley Mills at the beginning of the film. It is uncredited. 1. The family appeal of this kind of film? Its connection with similar kinds of television series? Enjoyable adventure ? and the message about ecology and conservation? 2. The combination of British background and interests, American Texas and cowboy style and African wildlife and cattle ranching? The similarities between the United States and Africa? The comparisons for the conservation message? 3. Colour photography, animal sequences, special effects? Aerial photography and the visual impact of Africa? 4. The basic situation of cattle and the destruction of the grasslands, wildlife and their preservation ? eating crops, illnesses and carrying these? The Masai and their traditional way of life, reverence for cattle? The British interests in Africa, the background of Rhodesia Zimbabwe? The Americans and their technical know-how in rounding up animals? The Africans and their own country, tribal life, collaboration with the British? The film's emphasis on harmony, progress, education? 5. The American characters, their arrival, appearance? Jim and his reputation in rodeos? John Henry and his Navajo background, his making comparisons with the Africans ? and joining in their celebrations? Jim as the strong tough American type? The rounding up of the animals, losing sow of them, the friendship with Hayes, the clashes with Becker? Jim and the rugged romance with Fay? The clash with the doctor? The befriending of Sampson? The difficulties with the animals, the final roundup, the animals being let loose, Jim and his being lost and rescued? The happy ending and his decision to stay in Africa? 6. John Mills' style as the typical Britisher as Hayes? His plans, aims, clashes with Becker? 7. Fay as romantic interest ? her work in studying the Masai, collaboration with Hugo? His work and interests? The clashes with Hayes and with Jim? The resistance to romance, the strong tough approach, her wilting? Hugo letting her go? The happy ending? 8. Becker and his style, manner, accent, abruptness. violence? His spies, his concern about his cattle.. the lengths to which he would go to prevent the animal roundup? Letting the animals loose? The fight with Jim? The justice of his cause about the cattle? The inspection? 9. The background of the Masai, their way of life,, starvation, feasts? Hugo and his work? Hayes and the collaboration of the Masai especially in the rounding up of the animals? Sampson and the future of Africa ? the wanting to go to America? Going to school? 10. The action sequences with the capturing of the animals, the herding, the letting loose, the re-entry? 11. Matinee material, entertainment, the insight into human nature and social issues?